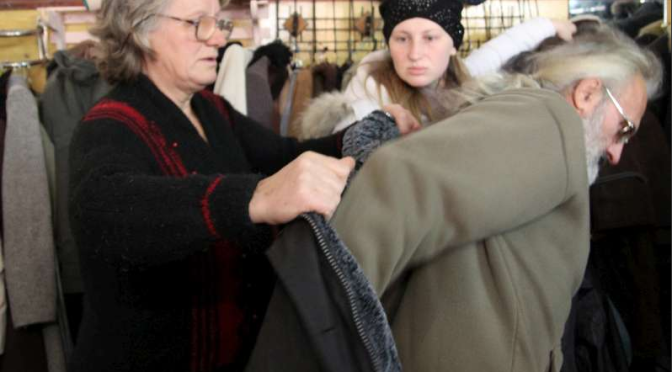 KHARKIV, Ukraine, February 11 (UNHCR) — In a room piled to the ceiling with clothes, a bearded man with a grey ponytail is trying on winter coats. Gennady, an architect and graphic artist in his early fifties, is in desperate need of something warm after escaping his hometown in eastern Ukraine and arriving in this frigid city in the summer clothes he was wearing in August when held captive for several weeks. «I do not have any warm clothes, nothing for the winter at all,» he says as his wife, Antonina, helps him try on a coat. «Even this thin jacket I am wearing now was lent to me by our friends who generously took us into their apartment here in Kharkiv,» he explains. Gennady says his troubles began when anti-government forces accused him of giving food and water to Ukrainian soldiers in their village near Luhansk, one of the central battlegrounds in the east. He suspects one of his neighbours informed on him. Finally freed in a prisoner exchange, he lost no time in leaving Luhansk. In Kharkiv he was reunited with Antonina, a former prosecutor who fled when Gennady was arrested. By the time he got here, the weather had turned bitter and the family had no money to buy any winter clothes, let alone a warm winter coat. So Gennady made his way to Stantsiya Kharkiv, a local NGO that runs a distribution centre where volunteers are dwarfed by mountains of donated clothing. On a typical day, displaced people choose clothing, food and even children's toys as generous civilians make their way through the throng with bags of new donations. Private citizens are playing a vital role in helping more than 1 million people displaced inside Ukraine to survive the bitterly cold winter. «People here are just amazing,» says Oldrich Andrysek, UNHCR's representative in Ukraine. UNHCR is seeking US$41.5 million to aid displaced Ukrainians this year, but those in need want the government to do more. «Ukrainians will open their apartments; they won't let people freeze on the streets,» Andrysek says. In addition to suffering from the cold, many displaced Ukrainians complain of not being allowed to work– or of facing discrimination from employers who prefer to hire locals. Vladimir, a middle-aged displaced man, has called the summer sanatorium Troyanda home since late August. It's in the middle of a forest near the small eastern town of Svyatogorsk. It was never intended as winter accommodation. As for Gennady, his three diplomas and expertise as an engineer might guarantee him a great job in most places. But not here. The only thing he knows for certain about his future is that he will not go back to Luhansk with its bad memories. With Antonina's help, the search for a winter coat ends successfully. Adjusting each model on her husband with a loving caress, Antonina finally gives the seal of approval. «This one will be okay,» she tells him. «This one will do. Let's take it.» In truth the sleeves are a bit long, but these days Gennady and Antonina cannot afford to be choosy.